A few weeks ago, it didn’t look like this game was going to be very important to the playoff picture. But now, after beating the KansasCity Chiefs last week, the Los Angeles Chargers have a shot at the No. 1 seed in the AFC. The Baltimore Ravens are holding on to the No.6 seed but have the Indianapolis Colts hot on their tale—and the Colts have a much easier schedule remaining. For one team, a win means survival. For the other, a chance for some late-season rest. The stakes are high for both—so, who’s going to win? Sometimes a change is needed during the season to give a team a spark. Ever since he took over for an injured Joe Flacco, Lamar Jackson has been that spark for the Ravens. Since taking over for an injured (but now healthy) Joe Flacco, Baltimore is 4-1 and holding onto the No. 6 seed in the AFC. So, it is not hard to see why the Ravens have decided to stick with Jackson at quarterback even though Flacco is healthy. If it isnt btroke, don’t fix it—right? The results do not lie. With Jackson at the helm,the Ravens are winning games. However, in the process, they are also becoming a one-sided offense. In Jackson’s four wins, the Ravens the ball for 200+ yards a game. In their one loss (against the Chiefs), they only had 127 yards on the ground. Passing has been Jackson’s weakness, so the Ravens avoid doing it and try to stick to easier, safer routes for Jackson. He has yet to throw for more than 178 yards and is completing less than 60 percent of his passes. It is hard to believe that the Ravens can win a game if they are forced to rely on Jackson’s arm. The Chargers will likely try to make the Ravens do just that. They do have the No. 9 run defense in the league, so they could make it tough on Gus Edwards and Lamar Jackson to gain yards. 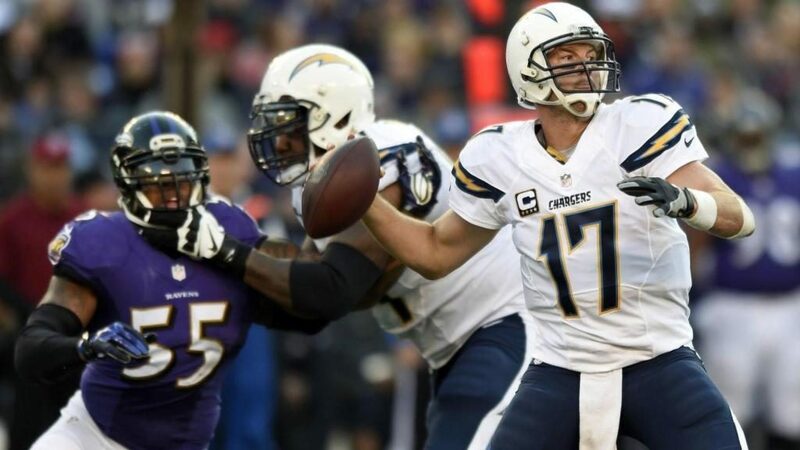 The Chargers may have better luck trying to keep the Ravens offense off the field—which will be easier said than done. Getting Melvin Gordon back will help, but the Chargers will probably want to make sure he doesn’t reaggravate his knee injury (so expect a heavy dose of rookie running back Justin Jackson. There is a chance that Philip Rivers may not have one of his favorite targets in the passing game. Keenan Allen left last week’s game with ahip injury. So far, it doesn’t look good for him this week. But with a shot ata bye in the first week of the playoffs on the line, if he can go, he likelywill. The Ravens have to keep the Chargers offense off the field if they want to win. With their defense and run game it is not hard to imagine it happening; it has in four of the last five games. But there is one important aspect of those games that has to be considered. All four wins were against terrible teams. To be fair, the loss was to the Chiefs and came in overtime. But when the Ravens could have used a passing game, they didn’t have one. The Chargers are a much better team on offense and defense than any that Lamar Jackson has faced. Baltimore’s defense will keep the game interesting. But the Ravens will not come out on top in this one. Los Angeles is favored by 4.5 points but will likely win by seven. As for the over/under, with defense expected to play a major role in this one, take the under (44).